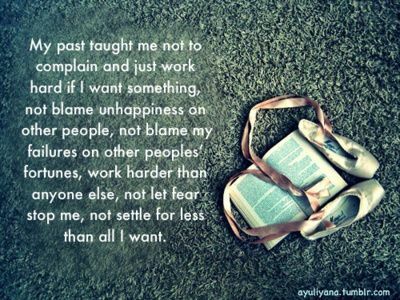 My past taught me not to complain and just work hard if I want something, not blame unhappiness on other people, not blame my failures on other peoples fortunes, work harder than anyone else, not let fear stop me, and not settle for less than all I want. We have to be willing to work hard when we desire greatness in life. Blaming others for our own unhappiness, and blaming our failures on other people will only delay us from seeing the great things in our life that we desire, or that we are destined to see. We may not always be the most talented, and we may not always have as many resources as other people, but when you are willing to work harder than anyone else and continue to do so, nothing can stop you from being where you want to be. Never let the fear of failing stop you from trying anything, you deserve greatness in your life when you work hard for it! Don't settle for less than you are truly capable of achieving. 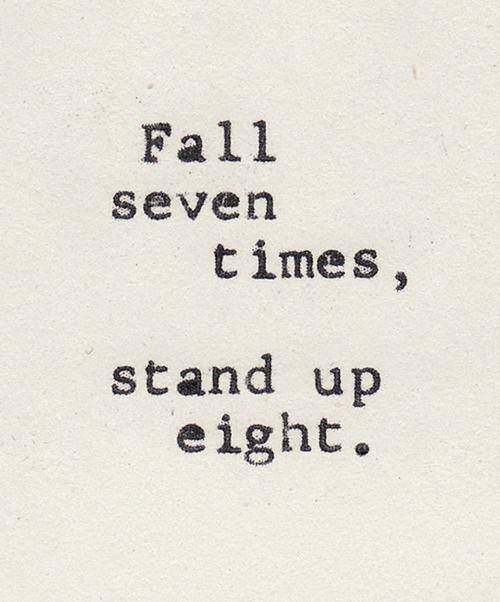 Keep fighting, keep pushing, and keep striving towards your destiny. Reach out and keep reaching until you reach your dreams! Be soft. 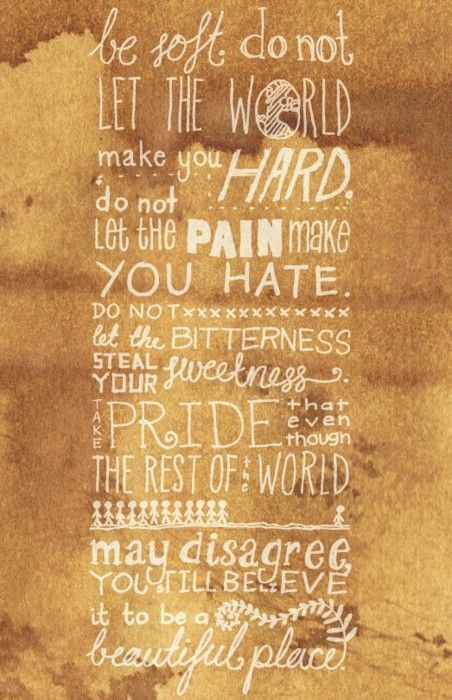 Do not let the world make you hard. Do not let the pain make you hate. Do not let the bitterness steal your sweetness. Take pride. Even though the rest of the world may disagree you still believe it to be a beautiful place. We all have experienced things in life that have given us a sort of thick skin, or as some may say pain that has caused up to put up a guard. Protecting ourselves is just part of our human nature, naturally no one wants to be hurt, and when we realize the things that hurt us we tend to stay away from them, or if we do go around the things that have made us hurt before, we go around them skeptically, sometimes with the intent to cause those things the pain that they may have caused us. In order for a situation to come to an end, one must let it. Even in the midst of defeat one can pull out a victory as long as they never stop trying to succeed. 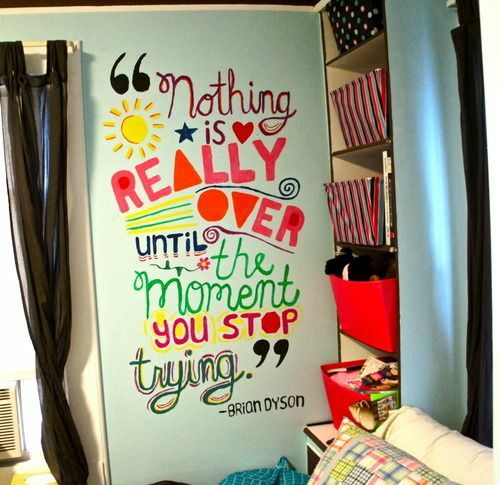 Too many times many of us are guilty of the shameful act of not acting, giving up, and stopping to try. Instead of succumbing to what seems will be like what will be certain defeat we must keep trying until the end is really present. I am strong because Ive been weak. I am fearless because Ive been afraid. 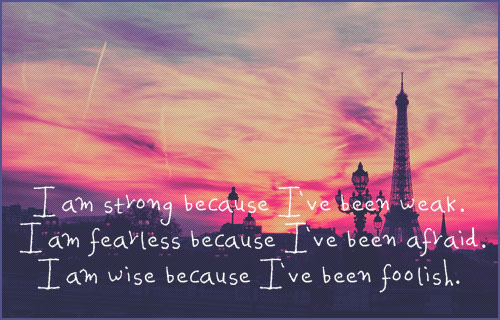 I am wise because Ive been foolish. The only reason that you are where you are today is because of your development over time. It is important not to live in the past but we must also be aware that our experiences are part of who we are, and have helped to mold us, shape us, and grow us. The hardest time to recoup is when we are at the bottom. It is hard to get up again when we feel that we may have lost everything we have, or when we may have failed for what we thought was the last time. Remember that you arent the only person in the world that has fallen. We have all encountered major challenges, come worse than what you may even be going through right now. In times when you have fallen, remember what your motivation is. Dream and reach for it. One of the most beautiful structures in the World, was the realized dream of the an engineer in his mid 50s by the name of Alexandre-Gustave Eiffel. As the winner of a contest for a structure in France to commemorate 100 years of freedom, Eiffels dream met many obstacles including opposition from those who didnt want a structure of the Eiffel Tower to dominate the skyline and from those who doubted that this structure could even practically be built. Eiffel is a classic example of a dreamer who reached for his dreams and was able to accomplish them despite the obstacles that stood in his way.